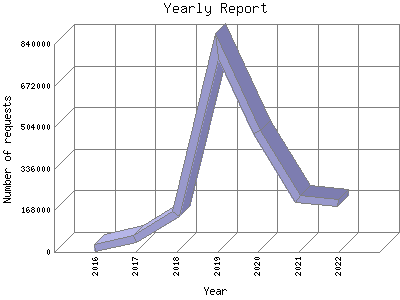 The Yearly Report shows total activity on your site for each calendar year. Remember that each page hit can result in several server requests as the images for each page are loaded. Note: Most likely, the first and last years will not represent a complete year's worth of data, resulting in lower hits. Most active year 2019 : 202,343 requests handled. Yearly average: 105911 requests handled. This report was generated on April 21, 2019 06:23. Report time frame September 4, 2016 00:15 to April 19, 2019 23:57.